Are you looking for a roofing material that offers an upscale look for your home or business? Consider the many advantages of slate. Used by roofers for generations, slate tile is made of stone and formed into uniform pieces—making it not only sturdy, but naturally beautiful, as well. While slate roofing tends to be expensive on the front end, it’s an enduring way to enhance the architectural look of any building. And your slate roof can last a century or more—making it a lasting investment that requires little maintenance. Slate roofing is an art. Your expert roofer will lay individual tiles on the roof pitch, blending colors and sizes to create a look of distinction. When your roof is complete, it will be naturally water repellent, fireproof and highly resistant to the elements. 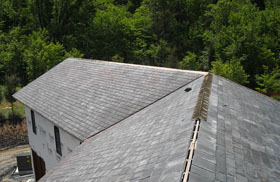 It is not uncommon for a slate roof to last for 100-150 years or more! Used on castles and cathedrals so it must be beautiful! Ready to explore the world of slate? 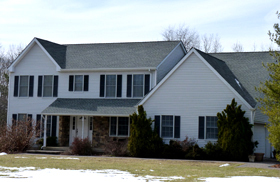 We invite you to schedule slate installation or repair estimate online or by calling 609-712-8157. Slate is heavy, so it’s important to have your home professionally assessed before making a final roofing material selection. go over color, style and design options. 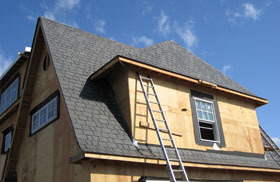 Contact us today and we’ll help you get the roofing you will love!